The trend towards midwife assisted deliveries is growing in the United States. The rate is still not that of the world average, but the rates are increasing. Healthland Time even went so far as to call the increase a “spike”. In other developed nations, midwives are routinely tasked with bringing new life into the world. Not so in the U.S., where delivery is largely presided over by obstetricians. But a new study finds that midwives are getting busier, delivering 8.1% of the country’s babies in 2009 — a record high. Slice the data differently and the proportion rises even further. Consider vaginal births only — midwives don’t do cesarean sections — and the figure rises to 12.1%, or about one of every eight deliveries, according to statistics from the U.S. Centers for Disease Control and Prevention (CDC). The state with the highest rate of midwife assisted deliveries is New Mexico. 24 percent of all births (not excluding c-sections) are presided over by midwives. That is three times the US national average. Why does New Mexico have the US’ highest midwife delivery rate? The state has a long history of recognizing the importance of midwifery care. Poor roads and long distances prevented many New Mexican mothers and infants from having adequate access to health facilities. Asaresult,midwivesdeliveredapproximately 27 percent of all births during the 1930s. In 1937 a Midwife Consultant Program was started with the goal of providing scientific education to supplement the midwives traditional, folk-based practices. Public Health nurses began training midwives individually and in groups “emphasizing the these clinics were still seen at the primary means of lowering the importance of cleanliness, non-interference, recognition of abnormal condition, the use of silver nitrate [to prevent infant blindness], and filling out the birth certificate” (NMHO 1941:48). By 1938, between 800 and 900 midwives took the training program and were certified by the State(NMHO1938). In 1940,public health nurses organized nutrition classes for midwives and their clients that emphasized traditional foods in planning a balanced diet with the needs of lactating and pregnant women in mind. Lesson plans were developed by the San Miguel Demonstration Project and disseminated during these nutrition classes (NMHO 1941). 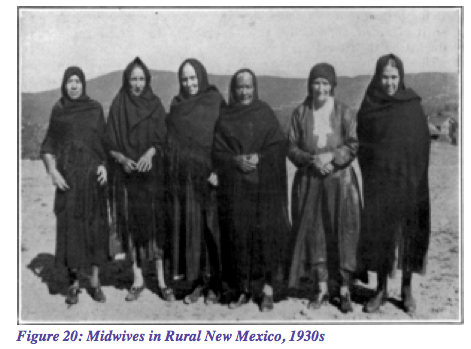 By 1950,9.3 percent of all New Mexico births were delivered by midwives or nurse-midwives,although the number differed by region: 11.8percent in Rio Arriba County, 12.0 percent in Santa Fe County,20.7 percent in Doña Ana County, and 5.6 percent in Bernalillo County (NMHO 1950). This is unlike California, where a physician must oversee all home births, and thus must be partially responsible for the statistics in New Mexico. New Mexico is one of the earliest states to enact legislation for certified professional midwives in 1978. Licensing requirements vary by state, and some states allow for direct entry midwives. Whatever the laws, increasing rates of midwifery care is beneficial to both babies and maternal care. I wouldn’t exactly call the recent increase a spike, but it is good to see an upward trend.